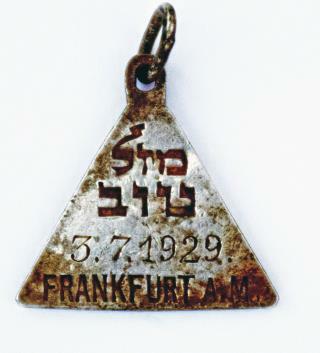 (Newser) – Chaim Motzen was intrigued when he read about a pendant excavated at a Nazi death camp with a possible link to Anne Frank. Engraved with "mazel tov"—"good luck" in Hebrew—the little charm belonged to Karoline Cohn, a 14-year-old Jewish girl killed at Sobibor. Motzen, an amateur genealogist, set out to find Karoline's family and discovered several branches, from the US and Israel to Nicaragua and Japan, the Times of Israel and Time report. On Monday, more than 30 of those relatives will meet in Germany to dedicate a stolpersteine, or "stumbling stone," a brass memorial plaque at Karoline's last known address in Frankfurt. Many of the girl's family members have never met, and some had no idea they lost relatives in the Holocaust. "We had this person who was completely forgotten," Motzen tells the Times. Sadly sweet. I saw the movie, "Escape from Sobibor" awhile ago. Following is taken from "Death’s Head Revisited", an episode of The Twilight Zone written by Rod Serling, 1961 *** The Narrator: "There is an answer to the doctor’s question. All Dachaus must remain standing. The Dachaus, Belsens, Buchenwalds; the Auschwitzes. All of them. They must remain standing because they are a monument to a moment in time when some men decided to turn the earth into a graveyard. Into it they shoveled all their reason, their logic and knowledge, but worst of all, their conscience. And the moment we forget this, the moment we forget its remembrance, then we become the grave diggers. Something to dwell on and to remember not only in the Twilight Zone, but wherever men walk God’s earth." Wow, such a beautiful, touching story.